Since my “mouthy no worky” due to illness early this month, I’ve been slowly regaining my sense of taste. For a few weeks now, even though my tongue is regaining a purpose in life, I’ve been desperate for foods that tasted like the good ‘ol days. Enter: vinegar. So I got a hankerin’ for some slaw one day and this idea turned in a two week long mission to find the perfect cole slaw recipe. I decided that when I developed the recipe I liked, I’d post about it. My friends, that day has come. Directions: While you are prepping the veggies, bring the vinegar, olive oil and seasonings to a boil on the stove top. With the sugar in there this will happen in about 2 mins, maybe less. Mix your now kinda-syrupy and warm vinaigrette and pour it over the top of your naked veggies. Toss all this yummy stuff together and let it sit for a few hours before serving. That’s it! Tips: I like unfiltered cider vinegar (but then I’ve been working on jump starting my taste buds so it could just be me.) I played around with several cole slaw recipes before I deduced this one. I don’t mind the mayonnaise type slaws, but they are so darn unhealthy that I figured I’d put my energy into the vinegar based kind. The real secret with this recipe lies in the heating of the dressing before putting it on the veggies. It doesn’t blanch the cabbage, per se, but the heat does do a little voo-doo which is nice. Plus, heating dissolves the sugar and makes for a nice light syrup. 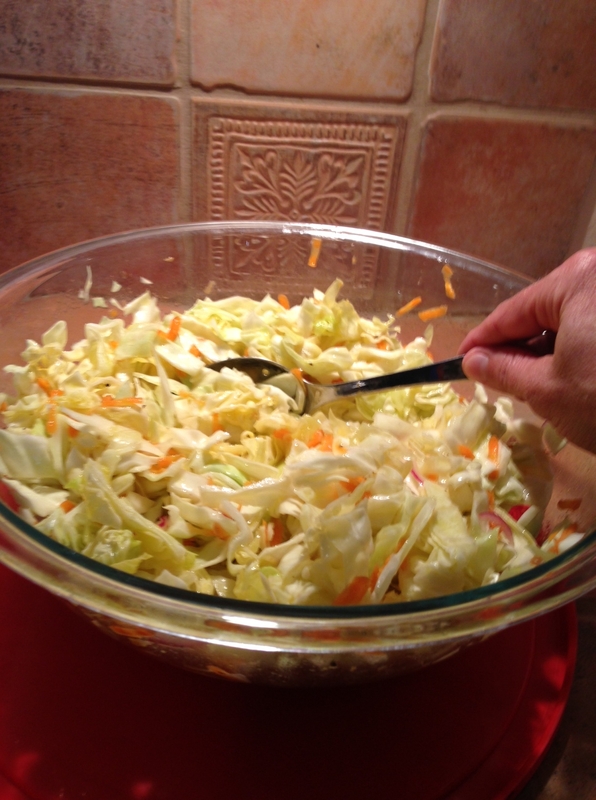 There are fancier concoctions that yield some nicely complex slaw situations, but for the effort, cost and taste, this simple slaw recipe gets my vote. Finally (seriously, how much can a person say about cabbage!?) I never knew how darn healthy cabbage is for ya! It’s loaded with fiber, vitamin C, E, calcium, serves as a blood detoxifier… plus it’s cheap as heck and literally lasts for weeks in the fridge. No wonder it’s such a big staple for so many cultures world wide. Well you had to know this was coming. I mean come on. What kind of winter menu doesn’t include at least a few crock pot recipes? Certainly not a menu from a born and bred Midwesterner! I actually have two crock pots, thankyouverymuch. One is a 4 quart (pictured here) and the other is about twice the size. Sometimes I use them both at the same time and I don’t even have to defend myself because that is perfectly OK.
Crock pots/slow cookers have a reputation as being rather unsophisticated. To this notion I say “pish-posh!” Actually these gadgets are the hippest cooking tool in town as they allow on-the-go meal planners to prep in advance, walk away for many hours and then come back to a delicious meal and a kitchen that smells like heaven. Cutting edge, baby. That’s me. I do step away from some of the “not quite food” items that Crockpot 365 recipes list at times (condensed soups, soda, sometimes sauces) but as Stephanie would approve, I simply substitute or delete completely and happily get on with my life. Today I am sharing one of my pork ribs recipes (not from Crockpot 365.) I really should have called this recipe “This One Time” because I don’t really use a single recipe when I make ribs in the crock pot. We like ours flavored with something sweet (honey, brown sugar) something tangy (balsamic vinegar, apple cider vinegar, orange juice) and something salty (soy sauce, salt) Feel free to put on your “Stephanie” and substitute away. 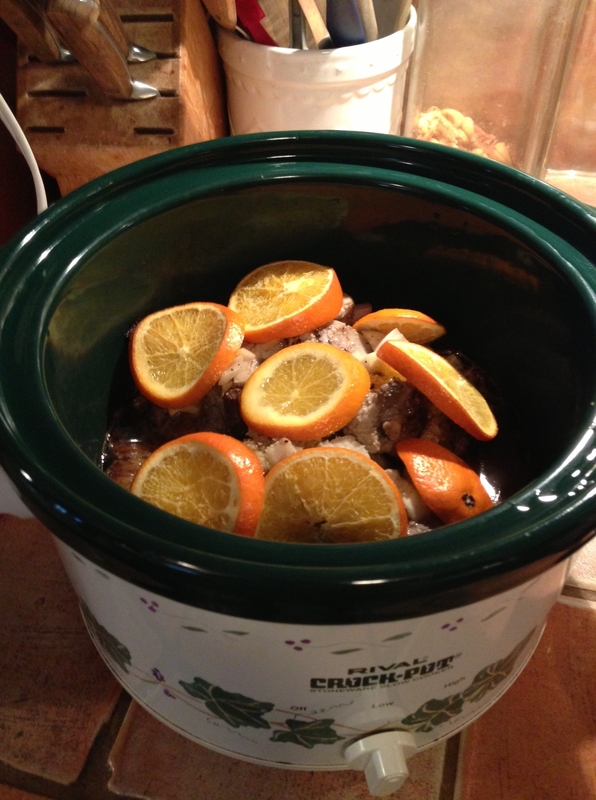 You can also check out Crockpot 365 for more delicious crocky fun. AND… I’ll be Michelle-izing one Stephanie’s posts for my Feb. 26 Hometown Pasadena Mangiamo Post. It’ll be tangy. It’ll be easy. It’ll be yum-ola. Ingredients: 2 lbs. baby back pork short ribs, 3 garlic cloves, 1/4 chopped onion, 1/3 cup apple cider vinegar, 1/3 cup low sodium soy sauce, 1/3 cup honey, few dashes pepper, sliced oranges on top. Directions: mix liquids (including honey) and drizzle over meat. Add rest of ingredients placing the oranges last on top. The liquid didn’t cover all the meat, so part way through I flipped the ribs over. Not necessary; just tried it. Cook in a 4 quart crock pot on low for 4-6 hours or until done. Serve with rice which is perfect for the extra broth. Yum!